Last major update issued on September 10, 2004 at 03:40 UTC. The geomagnetic field was quiet on September 9. Solar wind speed ranged between 345 and 358 km/sec. Solar flux measured at 20h UTC on 2.8 GHz was 131.0. The planetary A index was 4 (STAR Ap - based on the mean of three hour interval ap indices: 5.8). Three hour interval K indices: 11012122 (planetary), 12122122 (Boulder). At midnight there were 4 spotted regions on the visible disk. The solar flare activity level was low. A total of 3 C class events was recorded during the day. Region 10667 decayed very slowly and was quiet. Region 10669 developed early in the day, then began to decay. Region 10671 developed quickly during the first half of the day, since then some decay has been observed in the intermediate spots. There is currently a magnetic delta structure in the southern part of the large trailing penumbra. 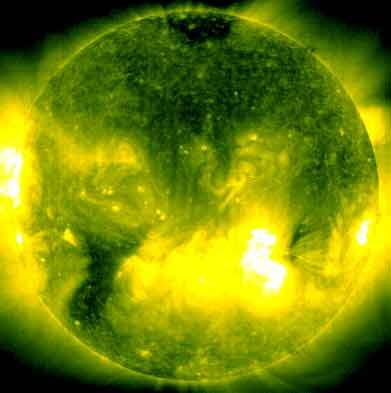 Flare: C2.6 at 06:29 UTC. New region 10672 rotated into view at the northeast limb. It is not yet clear if the southernmost penumbra should be split into a separate region, magnetograms currently indicate that the two parts of the region are not connected, neither in the positive nor in the negative polarity areas. The southern penumbra has been the most active and the corona above it is hot. C class flaring with associated coronal mass ejections is likely. Flares: long duration C3.2 peaking at 06:01 and C1.0 at 22:16 UTC. 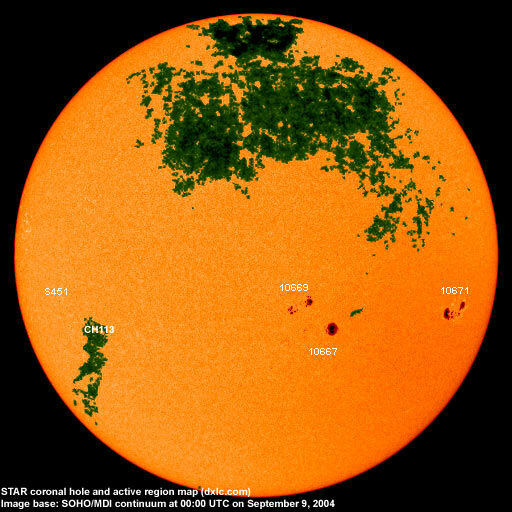 September 7-9: No obviously Earth directed CMEs were observed. A full halo CME was observed after the C2 event behind the northeast limb on September 7. A CME was observed above the central east limb after the C3 event on September 9. A coronal hole (CH113) in the southern hemisphere could rotate into a geoeffective position on September 12. Processed SOHO/EIT 284 image at 19:06 UTC on September 9. The darkest areas on the solar disk are likely coronal holes. 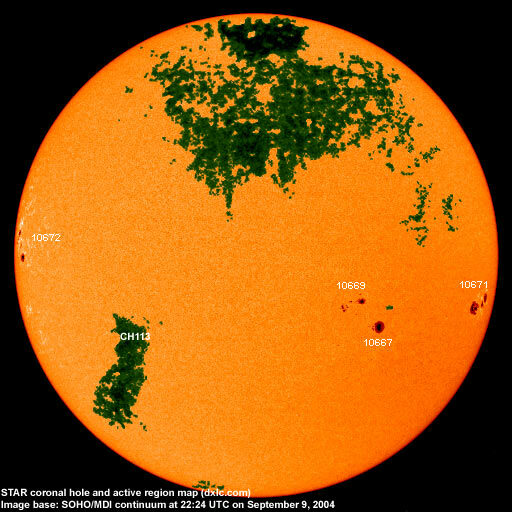 The geomagnetic field is expected to be mostly quiet on September 10-12. Long distance low and medium frequency (below 2 MHz) propagation along east-west paths over high and upper middle latitudes is good. Propagation along long distance north-south paths is very poor. Trans Atlantic propagation conditions are monitored every night on 1470 kHz. Dominant station tonight: WLAM Lewiston ME. Apart from a few stations from the Caribbean, a large number of North American stations dominated most of the other 10 kHz spaced frequencies in the MW band. WBBR 1130 had an impressive S9+20dB signal with several other stations topping S9. Greenland on 650 kHz had a strong signal as well. Propagation conditions could improve further during the next few days.